In my various essays describing how to configure colour management within Photoshop I briefly mention a feature called Proof Setup. So what is Proof Setup and why do we need it? Why do we need Proof Setup? Whilst our typical desktop inkjet printer uses CMYK inks, the images you create and edit in Photoshop are usually RGB. Likewise your monitors is designed to display RGB values. We know that prints are reflective and the output from the monitor emissive. We also know that the colour gamut and dynamic range of printed material is vastly different to that of our typical monitor. So given these mismatches between the printer and monitor a good visual match between the two devices is actually quite difficult to achieve. However, using the magic of colour management we can use our monitor to provide accurate preview or Soft Proof of how the image will actually print. Once we have an accurate preview we can usually fine-tune the RGB image to match capabilities of the CMYK printer. What do I need to make Proof Setup work? Making it work is what this tutorial is all about. Nevertheless, before you can even begin it will necessary for you to obtain ICC media profiles for your particular model of inkjet printer. Since media profiles are now available for most inkjet printers this isn't as difficult as it once was. Normally they'll be installed automatically with the Mac driver but PC users will probably need to download them from one of Epson's web sites. You'll also need to make sure that the monitor is accurately calibrated. The answer to this question very much depends upon the image being printed, the paper/ink combination and the quality of the ICC profiles that you intend to use. As mentioned above ICC media profiles will be required for each paper/ink/printer combination. However, no matter how good these profiles are they cannot work miracles and it's very rare for any media profile to do equal justice to all images. Typically, the dynamic range and colour gamut of the image will be compressed but other issues such as small changes in colour balance are equally possible. For some media types (e.g. matt paper) this compression can be quite marked. The method described below uses a workflow which is ssimilar to that of Bruce Fraser and David Blatner in the book Real World Photoshop. Actually, if you haven't already bought a copy then I recommend that you do. Stage 1 - Creating the soft proofing profiles. Before we can begin previewing our images, it is necessary to create the preview profiles. At this point I am assuming that you already have the necessary ICC media profiles. Ideally you should have no images open when creating the proofing profiles. From the Customize Proof Condition dialog choose the media profile that you wish to preview. Intent should be set to Relative Colorimetric or Perceptual (experiment to find which is the best match for the media you're trying to proof). Select the Simulate Paper Color checkbox. Simulate Black Ink will automatically be grey out. Give the preview profile a meaningful name. In the example shown below I have chosen Epson R2400 Premium Glossy_RC to signify that the profile is for the Epson 2400 printer when using Epson Premium Glossy paper. The RC extension denotes that proofing profile corresponds to the Relative Colorimetric Intent. Click OK and return to the Proof Setup menu. Notice that the new proofing profile has been added to the bottom of the list. It's probably best that you create all of your proofing profiles in one batch so that they'll be available when you need them. We begin this stage by opening the image that we intend to print. The example shown below has highly saturated reds that are particularly difficult to render correctly on all but very high gloss media. Select Duplicate from the Image menu and align the two images so that both appear on screen together. Select View > Proof Setup > Custom from the View menu. Choose the soft proofing profile from the list. Select Proof Colors form the View menu. Bruce Fraser suggests that you wish to temporarily look away from the monitor when setting Paper White to ON. This means that you don't see the very dramatic change in image appearance that occurs when this option is activated. The shift typically results in washed out shadows and compressed highlights when compared to the non-proofed version. By temporarily looking away from the monitor you're allowing your eyes to adapt to the change. In theory, the Simulate: Paper White and Ink Black options will take into account the limitations of the black ink and the brightness of paper white. However, depending upon the quality of the profiles theory and reality can be very different. Some profiles may not even allow the selection of the Paper White checkbox, although you shouldn't worry if it isn't an option. You will likely notice that the original image shows a change relative to the duplicate. Examples of the changes that can occur include the image, depending upon the profile being used, becoming flat lacking contrast and/or saturation or hue shifts. It may even take on a colour cast. Each image will react differently. 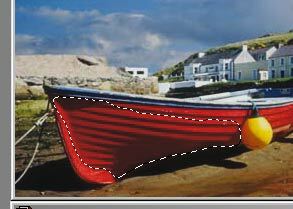 Although not obvious in the screen shot I find that in the example shown below the red in the shadow area (shown inside yellow boundary) of the boat darkens significantly, the remainder of the image changes very little. Photoshop is giving us a very useful message with the soft proof preview. If all has been configured correctly and the media profiles being used are accurate, we should see how the dynamic range and colour gamut of the image is going to be compressed when printed. Actually, with profiles for matt papers the change can be very dramatic. Many have balked at this point and gave up thinking that something was drastically wrong with their media profiles. Certainly, the Epson media profiles will tend to show less than ideal results with images containing saturated greens and blues. Make sure that you have the original image and NOT the duplicate selected. The duplicate will be used for reference; all edits will be applied to the original. Choose the New Layer Set option form either the Layer menu or via the Layer Palette. 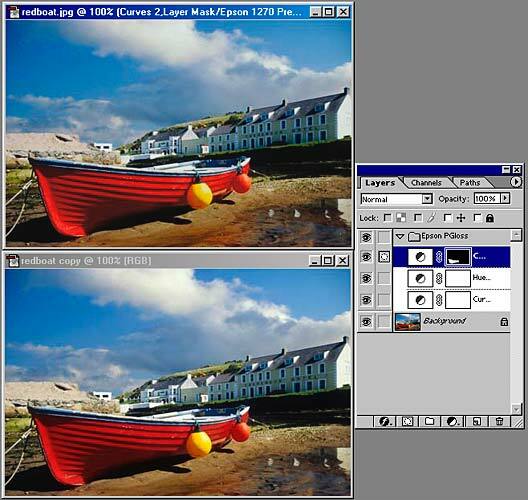 Each image will require its own specific set of edits such as a curves adjustment, hue/saturation, etc. The example shown here is curves edit and it should be applied via an Adjustment Layer. Select Layer > New Adjustment Layer > Curves. The adjustment shown above simply darkens the 3/4 tones and lightens the 1/4 tones. The mid-tones are fixed. My next edit was to increase the saturation of the reds. Again, an Adjustment Layer was used. Select Layer > New Adjustment Layer> Hue/Saturation. Even increasing the saturation of reds by 25% wasn't sufficient in some areas, so I made a selection of those areas that still required adjustment. Remember that if you make a selection it is best to apply some feathering so that an abrupt edge is avoided. A slight reduction in the shadows and a further increase in the 1/4 tones was sufficient to match the original with the duplicate. 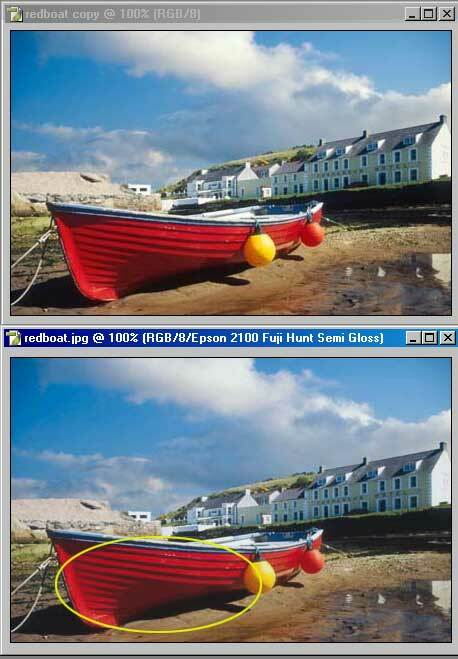 The screen grab below shows the matched pair of images along with the three Adjustment Layers making up the Layer Set for "Fuji Hunt SemiGloss Paper" on my Epson 2100 printer. Once we are satisfied that the edited original looks like the reference image (our unedited duplicate) we can save the original complete with the Layer Set. Remember the Layer Set contains ALL the edits necessary for printing on a specific media/ink/printer combination. If we need to print the same image on a different printer or paper, it will be necessary to switch the above Layer Set off and create a new one for the new combination. The main benefit of this method comes from using Adjustment Layers configured as Layer Sets. With Layer Sets we can maximise number of printer/ink/media combinations for any given image and yet only have a very small increase in file size. By way of example, I have images with up to four layer sets, each for a different media type or printer. The final stage of the process is to make the print. Rather than repeat material that is already available elsewhere on this site I have simply provided the link to the relevant tutorials. 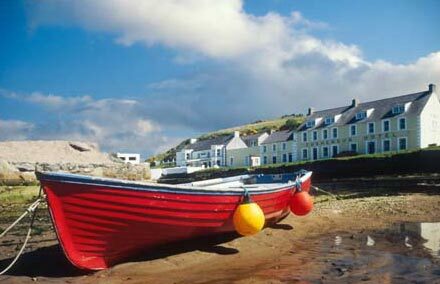 For more details on how to manage colour when printing within Photoshop 7 and CS see: - Managing Colour when Printing. For more details printing within Photoshop CS2 see the tutorial Print with Colour Management.